About 60% of the time, the main spindle units on machine tools are damaged because of collisions. • Use of the incorrect cutting tool and numeric control commands of machine tools (examples include incorrect dimension input, programming errors, incorrect feed, rapid traverse movements during manual operation or erroneous tool correction values). Collisions in machine tools can cause heavy damage to various machine tool components. Depending on the intensity of the collision, the damages could lead to an immediate breakdown or reduced lifetime of the machine components. The main spindle unit is one of the machine tool components most susceptible to damage during a collision. As shown in Fig. 2, 60% of the damages caused to the main spindle unit are from collisions. Rolling element bearings are among the machine spindle components most affected by the collision forces. Due to the small contact surface areas between the races (both inner and outer) and the rolling element, the maximum allowable interface pressure is exceeded when the collision forces are too high, which can deform or damage the rolling elements and the races. In addition, the tool interface and tool clamping system may also be damaged and need repair. Current collision protection strategies include both collision and damage prevention or reduction. The most popular strategies are process planning through CAD/CAM systems and CNC simulation, sensor-less and sensor based electronic systems, and mechanical systems that are either torque- or force operated. Each strategy has its pros and cons. In the event of a collision, the system allows a mechanical decoupling of the motor spindle from the feed axis, enabling a controlled deceleration of the feed axis to a stop before an overload occurs. The motor spindle is screwed to the inner ring of the prevention system at the spindle’s flange. The inner ring is in turn located within the outer ring, which is screwed to the head stock of the machine tool. The positioning of the inner ring to the outer ring and thus the location of the motor spindle is ensured by a precisely manufactured geometry. The required mounting forces are generated by using permanent magnets and preloaded springs. Depending on the spring pre-load, mounting forces up to 18 kN in axial direction and tilting moments up to 2,300 Nm (in case of a radial load) can be reached. The integrated damping elements absorb the surplus collision energy. The relative movement between the inner and outer ring is recorded at three points on the circumference in the axial direction using displacement sensors integrated in the system. The system cover and seals protect the unit from dust particles, chips and liquids. To determine the disengagement behavior under radial and axial loads, static forces were applied to the tool tip during tests of production prototype units. These forces were increased until the protection system was activated. Due to the negative stiffness properties of the permanent magnets, a sudden separation of the contact surfaces is possible when the maximum holding force is exceeded. For the spindle used in the tests, the forces/torque were adjusted to 18 kN in axial and 2 kNm in radial cases. The signals recorded by the displacement sensor indicate the precision with which the system returns to its initial position (< 5 μm). Because this motor spindle safety system immediately disconnects the power transmission at the interface between the machine tool headstock and the motor spindle during a collision, shock sensitive components are protected from the potentially damaging impact forces of the collision. The system protects components such as spindle bearings, shafts, clamping systems, transmitter and rotary feed. 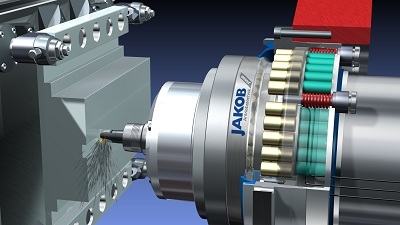 The Jakob system is available for all motor spindle designs and dimensions, is maintenance free, requires no external power source and includes an integrated sensor for highly accurate position control. The collision protection system from Jakob Antriebstechnik, Kleinwallstadt, Germany, and marketed in North America by GAM LLC is based on a double-flange design.